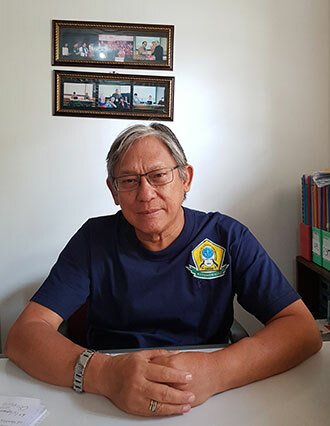 Stephen Suleeman - Ordained pastor of Indonesian Christian Church (Presybiterian) in Jakarta, with special assignment to teach at Jakarta Theological Seminary. He has been teaching at JTS since 1985. He has married to Indinah Kusnadi, with 2 daughters: Hortensia and Lavender. He received his education in the following schools: Trinity Theological College, 1978, Dept. of Communication, Faculty of Social and Political Science, University of Indonesia, 1987, Peace Studies at Bethany Theological Seminary, Oakbrook, Illinois, 1991, History and Christian Thought at Union Theological Seminary in Virginia, Richmond, Virginia, 1992 and Graduate Theological Union, Berkeley, CA, 2007.